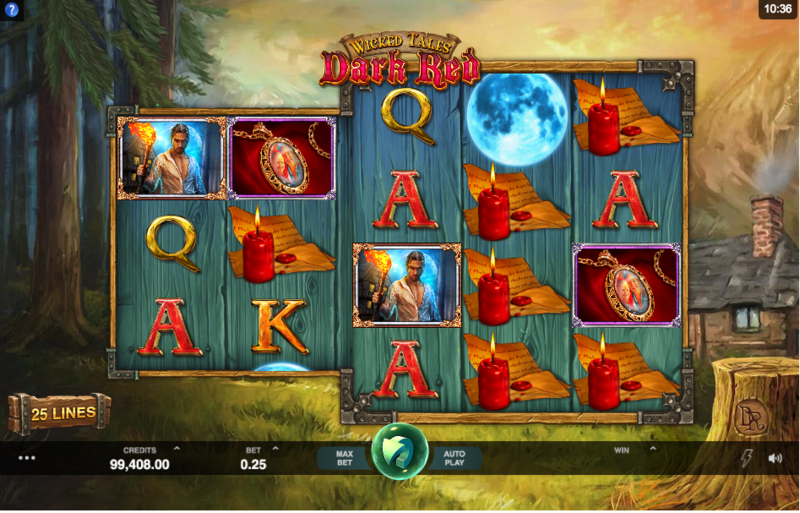 If you go down to the woods today then you may well bump into this fairytale-themed online slot based loosely on Little Red Riding Hood; it’s called Wicked Tales Dark Red, it’s developed by Microgaming/Triple Edge Studios and it comes with plenty of extra features. Wicked Tales Dark Red is a five reel slot with three/four rows and twenty five fixed paylines; those oddly-shaped reels spin against a forested, mountainous backdrop with a small house in a clearing. The section of the reel with four rows will move around the reels randomly, changing the payline pattern but not the number of paylines which always remains at twenty five. The theme-related symbols here include the male and female characters from this story, the wolf, the brooch, the pouch of gold and the candle; J, Q, K and A make up the lower values. The four-row set of reels an aso contain large, 3×3 symbols. The ‘Dark Red’ logo is wild and it will substitute for all others to help form winning combos except for the moon/Wheel of Fortune scatter symbol. Forest of Fortunes – pick from the bags to reveal axes, wolves or cash prizes; a wolf ends the round but an axe gives you an extra life, each subsequent cash pick will increment the win multiplier by 1x. 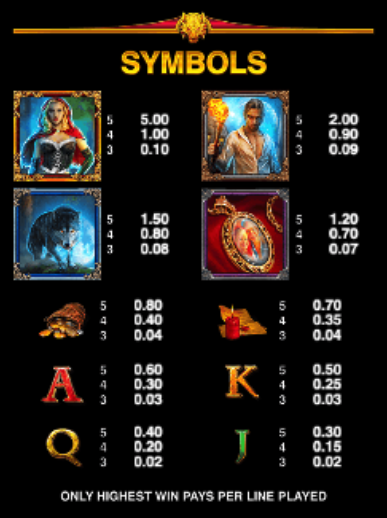 Free Spins – triggered by landing one of the four highest value symbols on the wheel; you’ll receive nine free spins with that symbol replacing all other high value ones. The four-row reels will move back and forth across the reels during the spins. Wicked Tales Dark Red is a slot which adds a sinister twist to the original fairytale narrative – as a game it’s got plenty going for it with some clever features, classy graphics and an appropriately haunting soundtrack. It comes with an RTP of 96.10%.